Structure My Deal tools are complete — you're ready to visit Fort Mill Ford! Navigate heavy traffic with ease thanks to Ford's new suite of safety features, known as the Ford Co-Pilot360, which is set to debut in all 2019 vehicles. With a host of thoughtful features that can take the guesswork out of shoulder checks and backing up, Ford Co-Pilot360 makes use of cutting edge technology and onboard cameras to protect the vehicle from collisions. When the vehicle senses a pedestrian ahead or behind, it will apply the brakes to avoid impact. It also monitors blind spots while driving to detect an obstruction and sounds an alarm to let the driver know objects are nearby. The Ford Co-Pilot also monitors the vehicle's position in traffic, warning the driver if the car starts to veer out of its lane unexpectedly. Auto high beams reduce driver fatigue by lowering themselves as they sense the approach of oncoming vehicles. 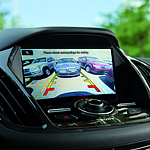 A rear camera allows the driver to visualize obstructions behind the vehicle as well as its position relative to other vehicles when backing into a parking space. Price includes a $550.44 closing fee and excludes tax, tag, other governmental fees, freight and destination charges if any. For new trucks only, price also excludes a dealer installed package which costs $1,047 and includes a bedliner, exterior and interior surface protection and vehicle anti-theft protection. ‡Vehicles shown at different locations are not currently in our inventory (Not in Stock) but can be made available to you at our location within a reasonable date from the time of your request, not to exceed one week. We have taken reasonable efforts to ensure display of accurate data; however, the information shown may contain errors and omissions, may not reflect all vehicle items and accessories, and errors with regard to pricing may occur. All displayed inventory is subject to prior sale and all prices expire at midnight on the date displayed. Price shown is for the state in which Dealer is physically located and if transferred to another state, the price may change. Dealer is not responsible for any errors but should be consulted in person to confirm the information on this page. USED VEHICLES MAY BE SUBJECT TO UNREPAIRED MANUFACTURER RECALLS. PLEASE CONTACT THE MANUFACTURER OR A DEALER FOR THAT LINE MAKE FOR RECALL ASSISTANCE/QUESTIONS OR CHECK THE NATIONAL HIGHWAY TRAFFIC SAFETY ADMINISTRATION WEBSITE FOR CURRENT RECALL INFORMATION BEFORE PURCHASING.